this is the marketing presentation i made for our church’s annual “week of prayer and fasting”. when it comes to the week of prayer and fasting, we have two different kinds of people in our church. first, we have those people who have been at the church for a long time. they have done many fast weeks before and it has become a sort of “ritual” our church does during the first few weeks of the year. they understand that they will go through this week hungry, tired and exhausted due to the many services. the second kind of person we have is the newbie. this person may have just joined or has been here for a year or so, but they have never heard of or experienced a fast week. although we may announce it from the platform (will talk about this problem in a sec) before the week arrives…they have no idea what it’s about. it goes in one ear and out the other. both of these kind of people bring the same result….un-involvement. the people who know about the week of p&f (prayer and fasting) have no idea when it is. they listen for pastor’s message about fasting, cause they know that always is preached the week BEFORE fast week. the people who are new find themselves say the wednesday or sunday following p&f “there was special services? what’s fasting?”. even with the people who do participate in fast week…how many actually get something out of it? who actually know what to do during that time? the point of this week is to….with all ways possible…make it clear that the week of p&f is about ASKING GOD and talking to Him. 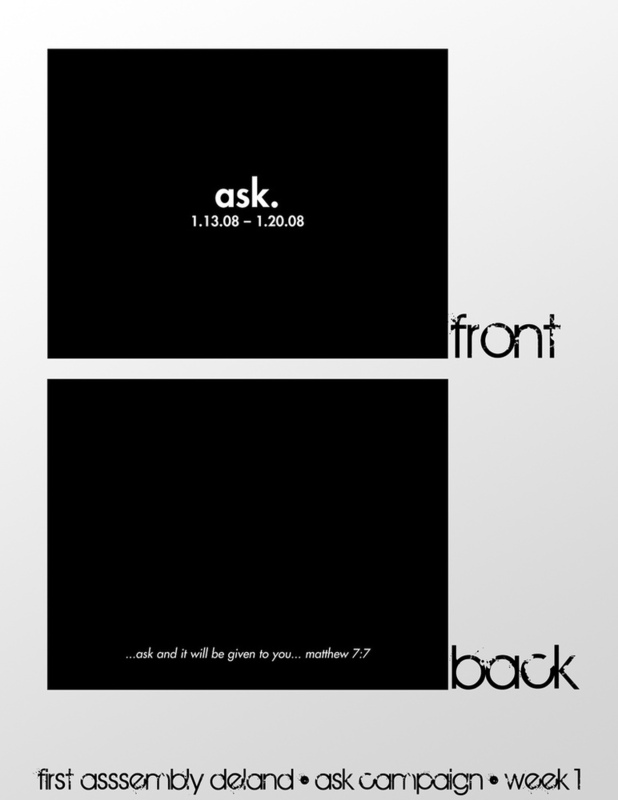 “ask” is the theme (yes, we are now having themes…like the tent) of this year’s p&f (also part of the proposal). we want people to understand that this week isn’t about going without food or coming to church every night…it is about spending a week with God and asking Him what is on His heart, what is His will for your life, for wisdom, for safety and health for family and friends, for provision. THAT is what we want to focus on corporately. this new card is a great way to start conversation…whether during offering, sermon, worship (hopefully we can do some “asking God for…” songs this and the following week) or just fellowship in the hallway after service. the back has multiple scriptures from the new testament (ESV) that concern asking. 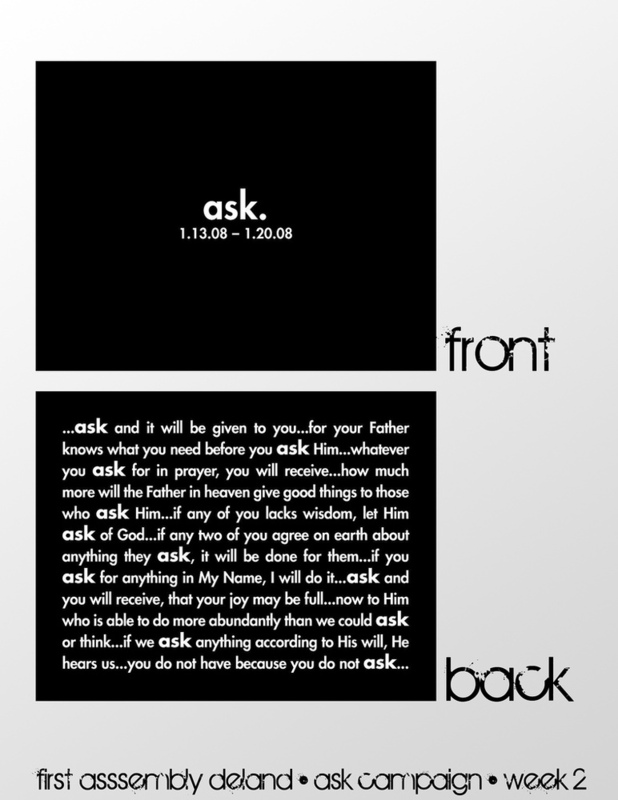 the word “ask” is also emphasized on the card to help the word “ask” pop out at people. the card starts with the same scripture as last week’s card…and ends with “you don’t have cause you don’t ask.” this helps cements the thought that “all you have to do is ask…He’s wanting to answer”. the week2 cards are placed on all the seats in the sanctuary as ANOTHER reminder that “the week” is only a few days away. we place all banners (if we decide to make them) in the sanctuary as a visual reminder that week what we are there for. it also brings the campaign to a climax.